We are so excited and delighted to be starting our venture into the world of hosting Blogland Challenges. We have been truly overwhelmed by the interest and wonderful support from fellow bloggers for this new blog and now the time has come for you to show us your wonderful creations. Your cards do need to be Clean & Simple; there is some information in the Glossary on the side bar if you're not sure exactly what this entails. Both of these cards obviously use the same image, and have lots of 'white space' although the second one has the image matted on a smaller rectangle and mounted on a larger card. The basic design is the same on both cards, but any preference would be down to personal taste. Those crafters unafraid of large expanses of unadorned card may prefer the second, but don't be afraid to leave empty spaces on your cards, it helps to focus attention on the important elements. The acetate image is then positioned over the card and the Lego fitted around the corner again. When happy with the position, keeping the Lego very still, the acetate is removed and using the Lego as a guide, the image is stamped onto the card. OK, so onto my card! As you can see there's also lots of white space...creating white space isn't actually any easier than filling every inch/cm with paper or card. It's all about the balance. The old 3 or 5 planting rule in the garden, also works on a card! That's something I cannot answer as to why it works, it just does! I had the idea in my head and started by creating the modern font on the computer. Regular followers of mine will know it's something I do often. So I placed the greeting off centre, then balanced the 3 circles on the opposite side. The large one off the page to make the eye think this wasn't just 'plonked' on!! I have glittered the damask pattern on the medium circle. CAS doesn't have to mean no detail, it just means simple lines and design. I added the 5 gems [notice that [darned] odd number again! but it still worked without it. So that's me this week, I do hope all you followers will join in. We will give you every tip we can as the weeks progress. All we ask is that you enjoy taking part, and get to know the community we hope to create. these cards are wonderful! And thanks for the mini tut! Love these they are fab, and love that welly image. Beautiful cards - do love the wellies image!! This should be a fun challenge! Simply Stunning are they all. Now to look for my image and sentiment ,mmmmm. Sensational cards ladies. Looking forward to pushing myself into doing more of the CAS style so that I can join in these challenges. Wishing you every good luck with your new venture. Gorgeous creations girlies will be back later with me creation..
oh well done girls, both cards are fab. congratulations on ya new challenge blog, im sure it will be a huge hit, i will be joining in, as i reall don't do CAS! Terrific! You gals perfect CAS with your cards. Chrissie, I am in awe of your beautiful shading on the boots and shoes! Lovely cards and your challenge blog is a fun idea! I´ve added your banner and a card for week 1! Fab cards from both of you. Thanks for a fab challenge....looking forward to the next one already. Might need to make another lol. Can we enter more than once as there are no prizes involved? your carsd are lovely but I don't know if I can cope with putting so little on a card. I will need to think about what to do for my card, hopefully I will be back fairly soon. Yay, nice to see somebody else with a DIY Lego stamp positioner! :o) Great samples for your first challenge - will try to play along this week. LOVE your handmade Stamp-a-ma-jig - with the $10 you saved you can buy new stamps!! WHOO HOO! Great start to the challenge, and your samples are lovely. And thanks for the tip about the DIY positioner. Will be raiding my grandsons' Lego! Congrats on the startup of the new challenge, Mandi and Chrissie. I hope my pink background counts as lots of "white space". These are lovely cards - and I love the white space. 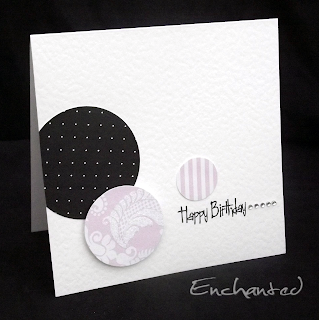 I always use the odd number rule myself whenever I can so its nice to know someone else does this in cardmaking too. Good luck with this first challenge, I hope to take part myself as its right up my street!!! Fabtastic cards - love them all. Off to think of a card for myself now!! Wonderful cards and awesome tutorial!!! Thanks for the fun!!!! Congratulations on the start of the new blog challenge - how exciting for you. I'm taking part already. Wishing you both a wonderful journey of inspiration and pleasure. Thank you ! This was definitely worth the wait! I will be eagerly awaiting each challenge. Love your inspiration cards! Thanks for sparking my mojo! First card I've made that I actually like! Both of your cards are lovely - really clean and simple - shows how little you need to make a lovely card! I am very happy to participate as I am learning! Thank you for starting this it will be fun! OOOOPS! For being an educator, I didn't read the directions very well! Please don't tell my boss! (LOL) I'll do better next time and thanks for letting me know. Hi ya!!! great new challenge! have added this to my list of challenges.... Thanks girls!!! By the way how many cards can we enter? Love your cards, thanks for the lego tip. Love your new blog, again best wishes for lots of success. Well, I've had a change of heart wrt the colour pink after having a play this morning. Thanks for making me think outside the box! It is Sunday night 8:53CST and you already have 45 uploads to your first challenge! Congrats on your exciting beginning!! So pleased there is another CAS challenge in blogland. The stamp positioner tut is great, keep them coming. Wishing you both all the best with Less is More. How beautiful, these Clean and Simple cards. Made it!!! Finally finished my card and uploaded to the challenge. Made to number 51!! I think this is going to be very popular! There have been some absolutely gorgeous cards made for this challenge - such wonderful inspiration. So very many talented card makers have entered some truly lovely cards - this challenge is a hit! Just found your blog - WOW...Love it! Those cards are gorgeous! The odd numbers thing works because our brain automatically wants to 'group' things we see, so if we look at 4 of something our brain will split them into 2 lots of 2. Therefore using odd numbers stops us seeing 'seperate' groups. This rule works for anything visual - gardening, card making, flower arranging, cake decorating, etc. I really like your idea of the Lego stamp positioner. Why pay big bucks for one when this does the same thing so nicely? Thanks for your comments on my blog - most kind - and yes I am looking forward to next weeks challenge now that I am no longer a card challenge virgin! Thanks for the great new challenge. I am trying to stick to CAS style cards this year but as my blog is about budget papercrafting (I don't use any of my proper cardmaking stuff!!) it's a bit tricky. Wishing you success with your new site and thanks for the tips and inspiration. I am loving this fab new blog, this is the first time I have entered a blog challenge. Fab creations everyone. Congratulations with your new challenge! It's great with a new one. Your cards are stunningly beautiful and very elegant. And very fun to se a DIY Lego stamp positioner, got one too! So glad i found your Blog it is just what i have been looking for! I set myself a challenge for 2011,to learn how to make 'less is more' cards and here you are answering my call. This is only the second time i have entered a challenge, the first was yesterday with a different theme. A challenge site for clean and simple - fabulous!! Love it. So many elegant cards. Well, I hope to have a go. Chrissie definately has seen the state of my workspace (!) so may find it hard to believer I can do CAS but I'll try....!!! So glad I have found you and can't wait for more challenges. My...so many entries. Congratulations girls on the success of your new blog....may you go from strength to strength! I had seen so many posts about your blog I just had to come and take a look. Love your cards. Congratulations on so many entries for your first challenge too. Looks like you are going to be busy ladies. Ooops, so sorry - I've Never done that before. I have put the correct link in now. Sorry. Brilliant new challenge, well done ladies for thinking it up. I'm sure we will all enjoy participating. oh what a fabulous challenge blog!! I just found you and am so excited to play along next round! Wonderful cards, love the Lego positioner...too fun! What a great new challenge blog! Thanks for the lovely inspiration. totally & utterly outside my comfort zone but I've had a go..... if it's not OK please just delete me. Oh no! I can't add my link and I played along! When is the deadline for each challenge. I love CAS cards and am very excited about this blog!! again sorry, deleted it myself I hope . These cards are simple but showing a decent look.